Dâmiany Pádua Oliveira1, Marislaine Alves de Figueiredo2, Bruno Lima Soares2, Otávio Henrique Stivanin Teixeira2, Fábio Aurélio Dias Martins2, Márcia Rufini1, Caio Peixoto Chain3, Ricardo Pereira Reis3, Augusto Ramalho de Morais4, Fatima Maria de Souza Moreira1* and Messias José Bastos de Andrade2. 1Sector of Biology, Microbiology and Biological Processes, Soil Science Department, Universidade Federal de Lavras, Caixa Postal 3037, Lavras, MG 37200-000, Brazil. *Corresponding author: fmoreira@dcs.ufla.br 2Department of Agriculture, Universidade Federal de Lavras, Lavras, MG, Brazil. 3Department of Management and Economy, Universidade Federal de Lavras, Lavras, MG, Brazil. 4Department Exact Sciences, Universidade Federal de Lavras, Lavras, MG, Brazil. Symbiosis of common bean with nitrogen-fixing bacteria can lead to a reduction in production costs and in environmental impacts. Considering the diversity of soils and climates, it is important to validate bacterial strains under different conditions to consolidate their recommendation as inoculants. Studies concerning the economic viability of Rhizobium inoculation in common bean are few, but they could assist in choosing the strain to be adopted. The aim of this study was to evaluate the performance of Rhizobium strains isolated from acid soils from the Amazon inoculated in seeds of the BRSMG Madrepérola cultivar and to evaluate the economic viability of their use in the field. Four field experiments were conducted in the state of Minas Gerais, Brazil. A randomized block experimental design was used with four replications and seven treatments: inoculation with the strains CIAT 899 (Rhizobium tropici), UFLA 02-100 (R. etli), UFLA 02-68 (R. etli bv. mimosae), UFLA 02-127 (R. leguminosarum bv. phaseoli), and UFLA 04-173 (R. miluonense),plus two controls, one without inoculation + mineral nitrogen (N-urea) at a rate of 80 kg N ha-1 and another without inoculation and without mineral N. The strain CIAT 899 is already recommended for the manufacture of a commercial inoculant, and the others, collected in the Amazon Forest, have proven to be highly effective in biological nitrogen fixation. Symbiosis of common bean with all the strains evaluated leads to satisfactory yields, with reduction in the application rate of mineral nitrogen and in environmental impacts and, consequently, reduction in economic costs, with higher profitability. Plant growth promoting rhizobacteria, which include symbiotic atmospheric nitrogen (N2) fixers, are important tools for sustainable agriculture (Barea, 2015; Lagos et al., 2015; Larsen et al., 2015). Common bean is a legume that exhibits the ability to fix N2 through symbiosis with bacteria of the Rhizobium genus and other genera, which are capable of providing at least part of the N required by the plant for its development, resulting in significant savings in the use of N fertilizers (Moreira, 2008). In spite of this ability, biotic and abiotic factors can act in reducing the efficiency of this relationship. Prominent limiting factors include competition of the rhizobium with inefficient native strains established in the soil (Araújo et al., 2007) and adverse environmental conditions, such as high temperature (Raposeiras et al., 2002), soil acidity (Vargas and Graham, 1988), and other soil factors, such as aluminum (Al) and manganese toxicity (Tsai et al., 1993). To maximize the contribution of biological nitrogen fixation (BNF) in soils, mainly in tropical soils where these conditions are more pronounced, it is necessary to use strains that are more adapted, competitive, and efficient in the infection process (Rufini et al., 2011). In this respect, studies have been undertaken, showing good results in the field not only with the strain CIAT 899 of Rhizobium tropici, whose symbiotic efficiency is already well known (Graham et al., 1994), but also with strains isolated from acid soils with high Al content from the Amazon (Soares et al., 2006; Ferreira et al., 2009; Nogueira et al., 2017). Studies in regard to the economic viability of inoculation with Rhizobium in common bean, however, are few, but they could assist in choosing the strain to be adopted. Considering the diversity of climates and soils, it is important to validate strains that have provided satisfactory results in different soil and climate conditions and, above all, that increase return on the capital invested in the common bean crop. This information will contribute to consolidate recommendation for their use and consequent approval as inoculants. Thus, the aim of this study was to evaluate the performance of Rhizobium strains isolated from acid soils from the Amazon, and to evaluate the economic viability of their use in the fields of Minas Gerais. Four field experiments were performed during the 2012/13 spring-summer crop season in the South (Lavras and Lambari), Triangle (Uberaba), and Upper Paranaíba (Patos de Minas) regions of the state of Minas Gerais, Brazil. A randomized block experimental design was used, with four replications, and five treatments inoculated with Rhizobium spp. (strains CIAT 899, UFLA 02-100, UFLA 02-68, UFLA 02-127, and UFLA 04-173), plus two controls without inoculation: one with N from urea (80 kg N ha-1, ½ at sowing and ½ in topdressing between the V3 and V4 stages of the crop cycle), and another without mineral N.
All the experiments were established in an Oxisol (USDA classification), using a conventional tillage system, with one plowing and two harrowings, in areas with no previous records of inoculation of bean plants or of other leguminous species. In Lavras, Uberaba and Patos de Minas, the soils had previously been used as pasture, while the soil of Lambari had a history of maize cropping. The native rhizobial populations able to nodulate beans at the four sites were approximately 103 colony-forming units (CFU) g soil-1. These most probable numbers were determined as described by Rufini et al. (2011).The results of analysis of soil samples, geographic coordinates, and climate of the areas are shown in Table 1. A summary of the main climatic occurrences during the period of the experiments is shown in Figure 1. Figure 1. 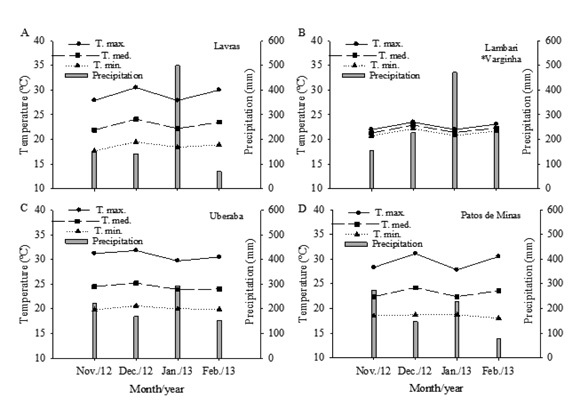 Monthly variation of maximum, mean, and minimum temperatures and rainfall recorded between 1 Nov. 2012 and 28 Feb. 2013 in Lavras (A), Lambari* (B), Uberaba (C), and Patos de Minas (D), Brazil. Spring/summer 2012/13 crop season. *Varginha - INMET station closest to Lambari, Minas Gerais. Source: National Meteorology Institute (Instituto Nacional de Meteorologia- INMET). Rhizobium tropici strain CIAT 899 (Graham et al., 1994), approved by the Ministry of Agriculture, Livestock and Food Supply (Ministério da Agricultura, Pecuária e AbastecimentoMAPA) for the production of commercial inoculants for bean seeds, was used as a reference. The strains UFLA 02-100, UFLA 02-68, UFLA 02-127, and UFLA 04-173 were collected from different environments and soils of the Amazon and have shown high effectiveness in biological nitrogen fixation in common bean, as well as high tolerance to acidity and high Al concentration (Ferreira et al., 2009; 2012; Rufini et al., 2011; Oliveira-Longatti et al., 2013; Nogueira et al., 2017). The four strains of the bacteria with the UFLA code belong to the SBMPBS/UFLA (Biology, Microbiology, and Biological Processes Sector) collection of the Federal University of Lavras (Universidade Federal de Lavras). Identification and other characteristics of these strains are shown in Table 2. Table 2. Origin, characteristics, and identification of the Rhizobium strains used as inoculants for common bean (Phaseolus vulgaris L.) in the study. The inoculants were prepared with peat (sterilized in an autoclave) mixed at a ratio of 3:2 (w:w) with log phase cultures in a semi-solid 79 medium (Fred and Waksman, 1928), according to the procedures described by Soares et al. (2006) and Ferreira et al. (2009). The resulting material was applied at a ratio of 10 g per kg of seeds. Inoculant quality was monitored by counting the number of CFU and comparing it to the legal minimum number of viable cells, approximately 109 Rhizobium cells per gram of inoculant. The final concentration was about 106 Rhizobium cells per seed. Immediately after inoculation, seeds from the ,BRSMG Madrepérola, cultivar (Carioca grain) were manually sown at a density of 20 seeds per m at a sowing depth of 3 to 4 cm, with subsequent thinning to 15 plants per m.
Each experimental unit consisted of six 4-m-long rows spaced at 0.5 m (12 m2). Rows 1 and 6 were designated as borders; rows 2 and 3 were used for sampling during flowering; and rows 4 and 5 were harvested at maturation. In Lavras and Lambari, the furrows of all of the plots were fertilized with 70 kg P2O5 ha-1 (triple superphosphate) and 40 kg K2O ha-1 (potassium chloride), as recommended by Soil Fertility Commission for the State of Minas Gerais (Comissão de Fertilidade de Minas Gerais). In Patos de Minas and Uberaba, base fertilization was 300 kg ha-1 of 00-30-15 fertilizer. In all locations, these fertilizers were applied mechanically during furrowing. Seeds were manually sown immediately after fertilization. In the mineral-N control, the topdressing (40 kg N ha-1) was applied manually with distribution in a continuous stream along the side of the plant rows. Weed control was performed using a mixture of 0.9 L fomesafen (Flex®) + 1.7 L fluazifop-p-butyl (Fusilade®) per hectare. Manual weeding was performed as required. None of the treatments received irrigation. Pest control was not required in Lambari; however, the insecticide lambda-cyhalothrin (Karatê® 50 CE, 150 mL ha-1 c.p.) was applied as a preventive measure in the other locations at 20 days after emergence (DAE), at a spray volume of 400 L ha-1. Samples were taken at random from 12 plants from each plot, also during the flowering stage, to determine the nodules number (NN), nodule dry matter (NDM), shoot dry matter (SDM), shoot N concentration (SNC), and shoot N accumulation (SNA). At maturation (stage R9), the grain yield, and grain N concentration (GNC), and grain N accumulation (GNA) were determined at 76 DAE in Lavras, 79 DAE in Lambari, and at 81 DAE in Uberaba and Patos de Minas. Grain yield was corrected to 130 g kg-1 moisture and calculated based on threshing the pods from all the plants of the part of the plot used for testing. The semi-micro-Kjeldahl method was used to determine SNC and GNC. The SNC was calculated by multiplying the percentage of N by the dry matter and dividing the result by 100. The GNC was determined through the same formula used for the shoot samples, with grain yield substituting SDM. All the data were subjected to individual and combined analyses of variance using the Sisvar version 4.0 software (Ferreira, 2011), after being previously subjected to normality (Shapiro-Wilks test) and variance homocedasticity (Bartlett test) tests, using the R software (R Development Core Team, 2011). The viability of the combined analysis was measured by comparing the magnitude of the residual mean square of the individual analysis. The variables of NN and NDM were first transformed to (x+1)0.5 in order to meet the requirements of analysis of variance. When significant effects of the crop locations and treatments were observed, the Scott-Knott test was used at p<0.05 for comparison of means; all analyses were performed using Sisvar software. Where: RIC = Return on invested capital (R$); INC = Income from production (R$); Py = Unit price of beans products* (R$ 1.79 kg-1), Y = Grain yield (kg ha-1); Pn = Unit price of nitrogen from urea* (R$ 2.00 kg-1); NA = Nitrogen amounts applied (kg); and C = Inoculant cost* (I = R$ 5.00 dose-1) and T = Tractor-hour cost* (T = R$ 60.00) for nitrogen application. *Prices based on consultation in Common Bean Information Center (Centro de Inteligência do Feijão-CIF). March 2013. Nodulation (NN and NDM) varied among the crop locations under study (Table 3). In Lavras, the values of NN and NDM were approximately three times greater than those registered in Patos de Minas, while in Uberaba, the values of these characteristics were intermediate. Although Lambari showed the same number of nodules as Uberaba, in the previous location the nodules had greater weight, equivalent to those observed in Lavras. Within each factor, means followed by the same uppercase letter within the same column are not significantly different according to the Scott-Knott test at p<0.05. 1Cont. w/N = Control with nitrogen application (80 kg ha-1 of N-urea) and without inoculation. 2Cont. wo/N = Control without nitrogen fertilization and without inoculation. §CV = Coefficient of variation. The treatments also differed in regard to the number of nodules. Lower NN values, around 25 nodules per plant, were obtained in the control with N-urea and in inoculation with the strain UFLA 02-68. The good performance of the other introduced strains in regard to NN was also observed in native strains (treatment without inoculation and without N-urea). In spite of the significant effect on this variable, the negative effect of the addition of mineral N did not affect the NDM, whose mean values were equivalents among all the treatments (Table 3). The greatest SDM was also observed in Lavras, more than double the values observed in Patos de Minas and Lambari (Table 3). As the accumulation of nutrients by plants, including N, is proportional to the accumulated dry matter, Lavras also provided greater SNA, and Patos de Minas and Lambari showed the lowest values; however, in Patos de Minas there was even lower accumulation. 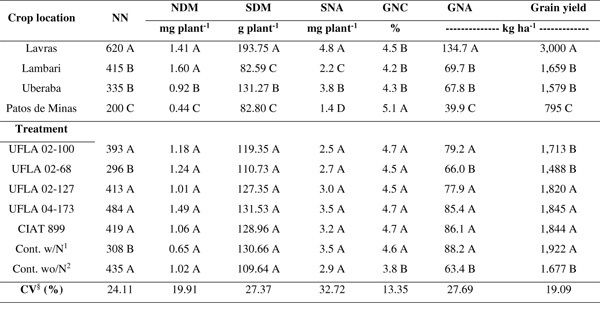 Plant growth (SDM) and SNA, with or without inoculation, were equivalent to the values provided by control fertilized with 80 kg N ha-1 (Table 3). The effects of the treatments on SNC, for their part, were dependent on the crop locations; but significant differences among treatments were only observed in Lavras, where the control with N-urea exhibited the greatest value and did not differ significantly from the strain UFLA 04-173 (Table 4). Except for the strain UFLA 02-100, with the lowest SNC in Lavras, the other strains showed SNC that did not differ from the control without N. In the other locations, all the inoculated treatments were equal to both controls (Table 4). The GNC was influenced both by the location and by the treatments. In Lavras, Lambari, and Uberaba, the GNC ranged from 4.2% to 4.5% and did not show significant difference, but in Patos de Minas, the N concentration (5.1%) exceeded that of the previously mentioned locations (Table 3). Regarding the effect of the treatments, it can be observed that all the inoculations promoted GNC similar to the nitrogen-fertilizer control. All these treatments, however, exceeded the 3.8% provided by native rhizobia (Table 4). In regard to N accumulations, only the strain UFLA 02-68 showed low GNA, which did not differ from the control without N. The other inoculations exhibited higher GNA and did not differ from the mineral N control (Table 3). Grain yield in the different locations followed the same decreasing order observed for GNA, that is, Lavras>Lambari, Uberaba>Patos de Minas (Table 3). The strains UFLA 02-127, 04-173, and CIAT 899 showed mean yields from 1,820 to 1,845 kg ha-1, which did not differ from the control with N. The strains UFLA 02-68 and UFLA 02-100, for their part, did not differ from the control without N (Table 3). In relation to the viability of the practice of inoculation, although the lowest effective operational cost occurred in the non-inoculated treatment, maximum economic efficiency was shown in use of the strain UFLA 04-173 (Table 5); returns at an average of 16% lower than this strain were provided by the treatments control without N and UFLA 02-68. The varied responses in relation to nodulation in each location show a strong influence from the environment in establishment of symbiosis. According to Sessitsch et al. (2002), the interaction between the legume and rhizobium is influenced by genotypic characteristics of the macro- and microsymbiont and modulated by an intense exchange of molecular signals. For Henson et al. (2004), these responses are furthermore conditioned by soil and climatic factors, which certainly interfere in the results. In fact, excessive rainfall was observed in Patos de Minas and Uberaba in the initial period of carrying out the trials (Figure 1), which may have impeded access and fixing of rhizobia at the sites of nodular infection, limited achievement of nitrogen nutrition necessary for the growth and development of the plants and, consequently, interfered in the yield at these locations. The greater sand fraction of these soils may have further worsened the situation. These arguments seem consistent and, apparently, these influences occurred in a more intense manner in Patos de Minas, where the negative reflexes simply did not fall on the GNC value. The good performance of most of the introduced strains in regard to formation of nodules was also observed in the control without N fertilization, which indicates the presence of native strains of rhizobium in the soil, which were capable of nodulating as much as the inoculated bacteria, resulting in equivalent mean values in NN and NDM (Table 3). This has been a frequent result in many situations (Figueiredo et al., 2016; Ferreira et al., 2009; Oliveira et al., 2016). The low nodulation of the strain UFLA 02-68 coincides with the results of Rufini et al. (2011), who found high sensitivity of this bacterium to the effects of the environment. The possibility cannot be excluded that some undetected factor unfavorable to weight of nodules may have interfered in the activity of this strain, resulting in low GNA and, consequently, a decline in yield (Table 3). The smaller number of nodules in the treatment that received nitrogen fertilization confirms the considerations of Moreira (2008) that associate reduction in formation of nodules to the excess of mineral N in the soil, through the lack of stimuli related to nutritional deficiency in the plant. This effect of the addition of mineral N, however, was not observed on NDM, but also was not favorable to plant growth (Table 3). The plant N concentration, one of the characteristics that reflect the efficiency of uptake and assimilation of this nutrient, including through BNF, was within the sufficiency range indicated by Ferreira et al. (2012), which is greater than 3%. 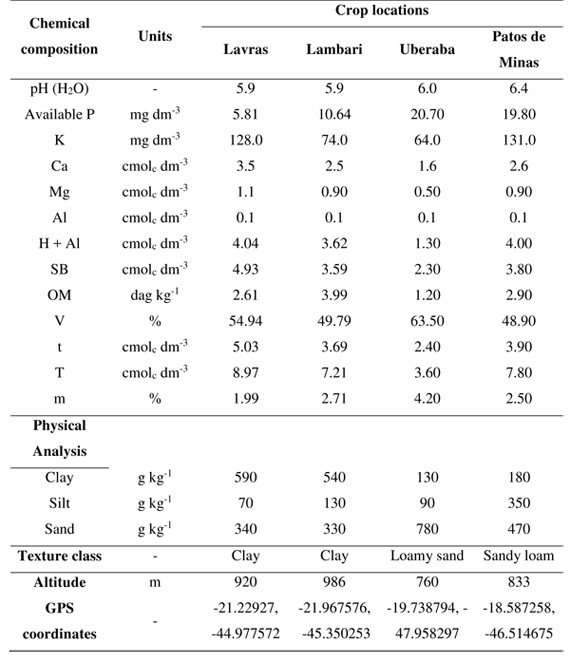 Although in Lambari, Uberaba, and Patos de Minas the SNC provided by the strains did not differ from those of either control, the greater concentrations of UFLA 04-173 in Lavras were equivalent to that of application of 80 kg ha-1 of mineral N, exceeding the other treatments, whether inoculated or not (Table 4). Elbanna et al. (2009) likewise found that the isolates R11, R13, R28, R49, and R52 obtained equivalent mean values and, in some cases, values even superior to the value of the nitrogen-fertilized control, which allowed them to be considered as potential strains for nitrogen fixation in the green bean crop, also of the same Phaseolus vulgaris species. The response of plant N concentration is related to factors such as N content available in the soil (arising from mineralization of organic matter), temperature, and genotype and to the density and activity of soil microorganisms (Moreira, 2008). Thus, high N concentration in the common bean plant are expected in soils with a high degree of fertility or with abundant populations of native rhizobia with high symbiotic efficiency (Ferreira et al., 2009; Figueiredo et al., 2016), conditions which were certainly not found in Patos de Minas. Uberaba and Lambari, for their part, proved to have more effective rhizobia, providing high N even in the absence of inoculation or mineral fertilization. In soils with less N or with low populations of efficient rhizobia, the effect of application of nitrogen fertilizers has provided concentrations superior to those found in plants without fertilization with mineral N (Soares et al., 2006; Rufini et al., 2011). In Lavras, where the SNC of the control with N-urea reached 4.2%, this increase appears to have occurred and complemented the contents provided by the native population (Table 4). The good activity of the inoculations was maintained also in relation to grain nitrogen, providing enrichment similar to that of the control with N-urea. Concentrations that were 22% greater were observed in comparison to control plants, without fertilization and without inoculation. These results confirm the effectiveness of the strains selected, which was also reported by Soares et al. (2006) and Fonseca et al. (2013). The high mean yield achieved in the trials is noteworthy, at the level of 1.800 kg ha-1, normally only achieved in crops of high technological level, which was not applied in these experiments. In Lavras, grain yield was much greater than the mean value estimated by the National Food Supply Agency (Companhia Nacional de Abastecimento - Conab) for the rainy crop season 2012/13 in Minas Gerais (818 kg ha-1). The low yield of Patos de Minas, which possibly occurred due to the activity of other factors, as previously mentioned, was compensated by greater N nutrition of the grain, resulting in the effect of concentration of this nutrient, which did not favor it in terms of accumulated content. This compensatory effect has already been reported in the literature (Figueiredo et al., 2016; Fonseca et al., 2013).The positive response of inoculation extended to common bean yield and to N accumulated in the grain. Mostasso et al. (2002) confirmed that use of the inoculation technique in favorable conditions, with adequate cultivars and strains and high technological level, can achieve yields of up to 2,600 kg ha-1. Ferreira et al. (2000) and Elbanna et al. (2009) likewise found that inoculation with efficient strains, or even the BNF promoted by native rhizobia, can reduce the need for supplying mineral N to the crop, without affecting the yield of common bean. In this study, three strains (UFLA 02-127, UFLA 04-173, and CIAT 899) provided grain yields equivalent to the yield of the control with N-urea, while two others (UFLA 02-68 and UFLA 02-100), just as the native population, produced around twice the mean yield of the state (Table 3). The occurrence of native strains is common under field conditions. Selected strains that were introduced (UFLA 02-127, UFLA 04-173, and CIAT 899) must have higher efficiency and must adapt to soil conditions and compete with native strains for root infection sites. The introduced strains certainly nodulated because their contribution to nitrogen fixation is evident, not only fromhigher grain yields in the inoculated treatments in relation to the control without inoculation (where there is only the contribution of native strains) but also from higher nitrogen accumulation in the grain. It is well known that acidity is a common limitation in tropical soils. The pH of the soils studied ranged from 5.9 to 6.4 (Table 1). Thus, it is noteworthy that these strains responded well even in soils with moderate acidity. When economic analysis is made, however, the advantages of inoculation in relation to yield exceed the control treatment. The greater effective cost of the treatment fertilized with 80 kg N ha-1 makes its use unfeasible through reducing the margin of return on investment, which, from the perspective of the producer, means a reduction in earnings from the crop. In contrast, the low cost of the inoculant has little additional cost compared to the control without N, yet provides high yields, resulting in increases in gross income, in which maximum economic efficiency is observed through use of the strain UFLA 04-173. Under the conditions in which this study was developed, however, it can be affirmed that the technique of inoculation of common bean with selected strains of Rhizobium is a real alternative for contributing to an increase in yield and return on invested capital in this important crop in Minas Gerais. These results are encouraging and represent not only savings on fertilizers, but also an ecological contribution, due to possible problems related to the use of high application rates of nitrogen fertilizers, especially when mismanaged. The environment has a considerable influence on the characteristics evaluated. In the soil in Lavras, there is greater nodulation, plant growth, and shoot and grain N accumulation, resulting in greater grain yield. Nitrogen fertilization with 80 kg ha-1, applied half at sowing and half in topdressing, reduces the number of Rhizobium nodules in relation to the inoculated treatments. In respect to the nitrogen in grain, and to yield, the inoculated strains UFLA 02-127, UFLA 04-173, and CIAT 899 have performance equivalent to that of fertilization with 80 kg N ha-1, but a greater return on invested capital, that is, the greatest profitability is obtained through use of the strain UFLA 04-173. The symbiosis of common bean with the strains evaluated allow satisfactory yields, with reduction in the application rate of mineral N and of economic costs and, consequently, environmental costs. We thank the Brazilian National Council for Scientific and Technological Development (CNPq), Agency for the Improvement of Higher Level Personnel (CAPES), Research Support Foundation of the State of Minas Gerais (FAPEMIG), and the Ministry of Agriculture, Livestock and Food Supply (MAPA) for research productivity fellowships, funding and scholaships; and the Company of Farming research of Minas Gerais (EPAMIG) for granting use of field areas.